Once a song is arranged in a certain key, how hard or time consuming is it to change keys? Do you have to completely rearrange the song? Or does the software drop and raise keys for you automatically? You have to make sure that all the new notes are still playable on all instruments. Most instruments have a fixed range so you have to make sure that the new notes aren’t out of range (neither too high nor too low). For example, you don’t want to have a bass chart with notes written below the range of the instrument. At the same time, every instrument also has a certain sweet spot where it sounds best, so you need to make sure that every instrument will still sound good and will be comfortable to play in the new key. 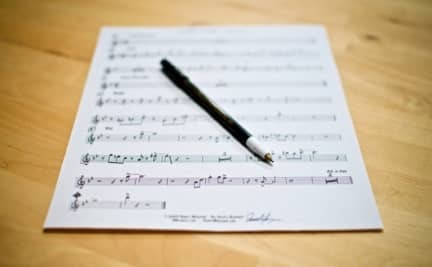 An arrangement can sound messy or will lose impact if horn parts are written too low, just as super-high parts can be extremely difficult to play. Some wind instruments might have trickier fingerings in different keys too. Sure, professional musicians should be able to play in any key, but that doesn’t mean that certain keys aren’t more challenging to read than others. A very straightforward, easy-to-read arrangement can become hard to read just by changing the key. And if something is already tricky to play as it is, putting it into a harder-to-read key only makes matters worse. If you’re changing to a new key only a semitone or whole-tone away, you can get lucky and the whole process is relatively simple with just a couple of minutes spent in the software. Sometimes you need to adjust by an additional semitone or two to get to a more readable or playable key and then the process stays just as uncomplicated. But other times, transposing an arrangement to a new key can involve a lot of re-writing. Of course, this isn’t a complete list of things to consider when transposing a chart either, so it really goes to show that there’s much more involved than just clicking a button and expecting the software to do all the work automatically. Transposing Charts was published by Daniel Menjívar on September 15, 2016 at 12:00:32 PM EDT and last updated on April 18, 2019 at 4:41:20 PM UTC .